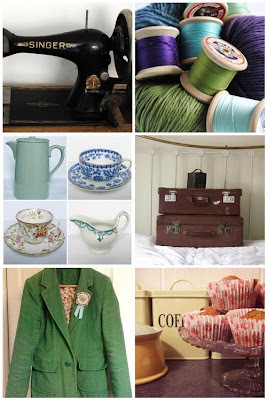 To leave you in no doubt about the enthusiasm and general loveliness of The Green Gal's Gabrielle Treanor, her email containing this post started with the words, ‘ooh, I enjoyed making this!’. She might be quite new to the whole crafting thing, but is no less talented for it, and I’m having a ball following along, both on her blog and in real life. We asked her to make us something pretty for the party, and tell us the story behind it. My name is Gabrielle, I live in a little cottage in a little village in Surrey, England, with my husband and a little dog called Georgie. I've enjoyed making things since childhood but only in the last few months have I realised that it's what I enjoy doing most of all. So, with this realisation I've been experimenting with different styles, trying out different sewing techniques and making lots of different things. Next month I'm going to start selling my handmade goods online, a big step for me! 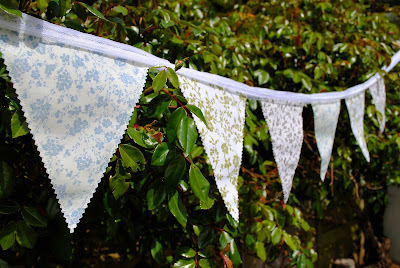 Through my experimentation I've discovered I love bunting! I love to make it and to see it hung up. 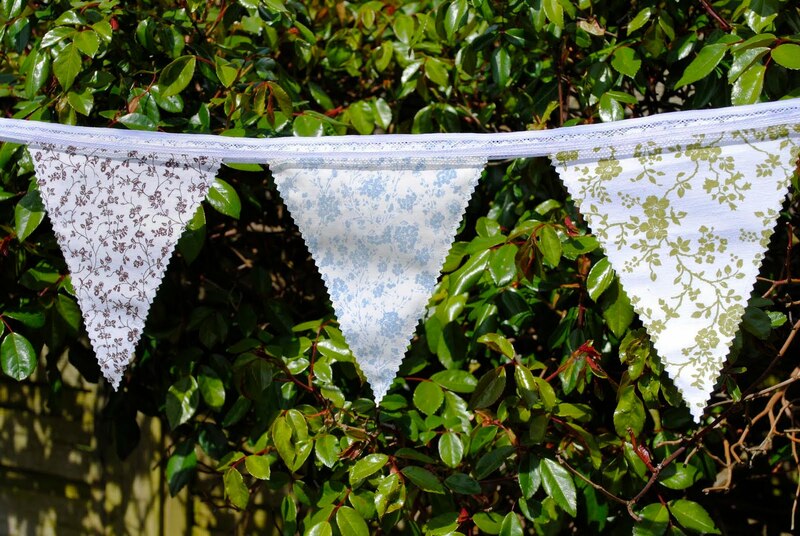 Bunting can make any place look that little bit more lovely, whether it's in the garden, kitchen, bedroom – really anywhere! 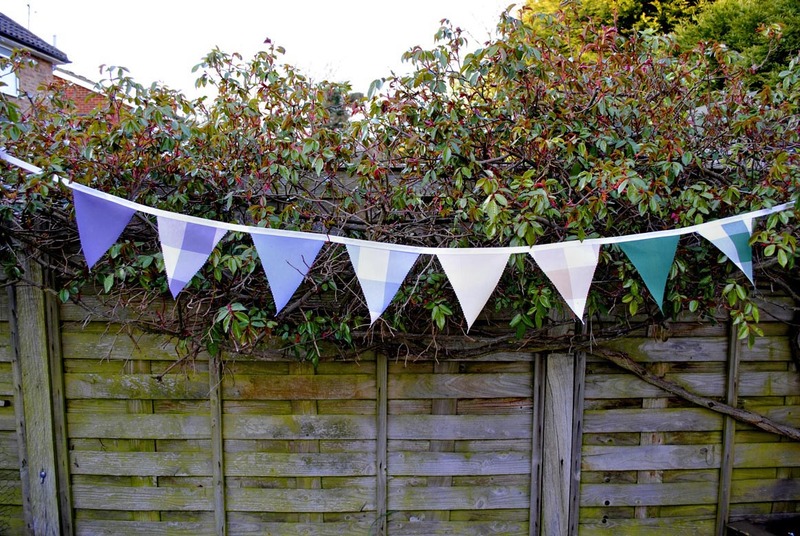 I think no party should be without bunting but it's also a little bit of beauty to have decorating your home all the year round. A variety of things inspire me – I have a passion for anything with a history, a story to tell. I like living in a Victorian house because I can try to imagine all the different people who lived here before me, the clothes they wore, the experiences they shared. I love vintage homeware too, partly because of the story it has to tell but also many items were made so beautifully years ago, and made to last. There is a lot of wisdom in the past which I think we've lost in recent years, although there is something of a 'dig for victory, make do and mend' resurgence happening at the moment. I don't think life was simpler decades ago but I do think people were more connected to the world around them. Growing your own food, finding ways to reuse items, refashioning clothes, making meals from scratch – it's all simple stuff that our parents and grandparents did automatically but which now can be seen as unusual or even fashionable! 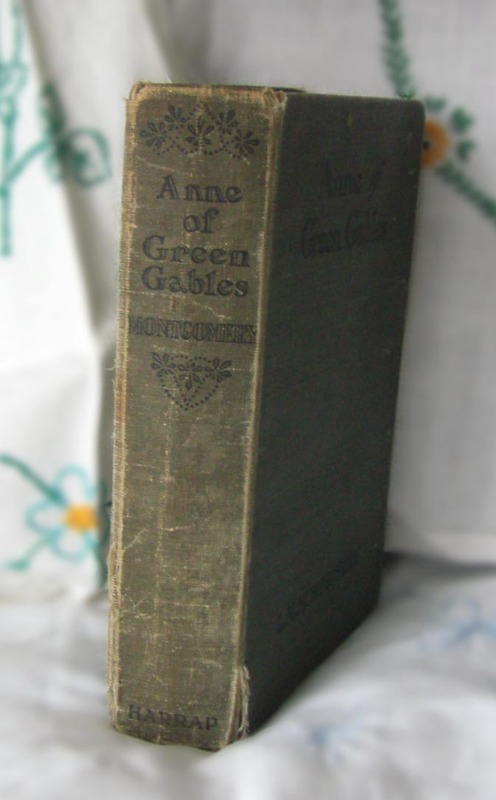 Another big source of inspiration for me is the book and world of Anne of Green Gables. If you're unfamiliar with the title, the book was written by LM Montgomery at the start of the 20th century, it's about an orphan girl who goes to live with a spinster and bachelor sister and brother and the eventful life she creates on Prince Edward Island, Canada. There are several books in the series and I first fell in love with the story when my mum told me to watch a TV adaptation in the mid 1980s. I was the same age as Anne then and that was it, hooked! There's something about Anne's fiery spirit, fierce loyalty, incredible imagination, unfailing romanticism and downright loveliness that I find so appealing and inspiring. My mum has given me her set of Anne books, which originally were owned by her aunty, and they are one of my most prized possessions. So, with Anne as my inspiration and in celebration of Copy + Paste's first birthday I have made a length of bunting using vintage fabrics and lace. Usually my lengths of bunting include eight flags but the lace ribbon I had was a little short, once doubled up, so I've gone with six flags instead. 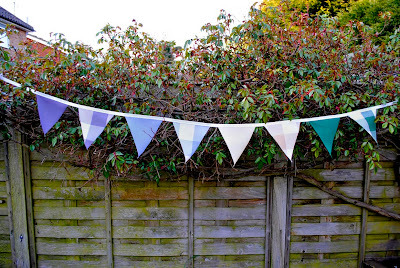 The bunting is double-sided so can be strung across a room at C+P's party or perhaps in the garden, as I've photographed! I'm not sure if Anne ever made bunting but I'm sure she'd approve of it, as she says: "One can dream so much better in a room where there are pretty things." Happy birthday, Copy + Paste! Adorable, yes? 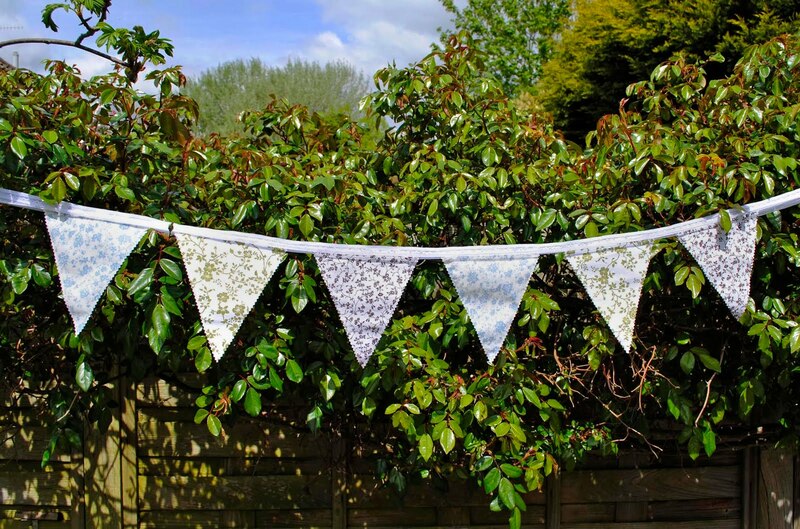 If you’d like some equally-lovely bunting to decorate your own house, garden or birthday bash, head on over to Gabrielle’s blog, The Green Gal, where she’s giving away the pretty garland below. As well as keeping up with her adventures in sewing, baking, thrifting, veggie-growing, it’ll also keep you posted on the launch date for her handmade-goods business next month. Thanks so much, Gabrielle – we love you! I love anne of Green Gables too. I can't think of it without crying! Love the bunting. I've been coming across Gabrielle every so often via Twitter and Flickr and I'm so pleased to have read through this post. We truly share a love of old, beautiful things and I feel so inspired! I think my Green Gable movies are still packed, I might have the...yes, I just found my two books! I have found over the last year or so that I love bunting too. Hi Sian, I'm so sorry, I've jsut discovered that my typepad blog has a problem in Internet Explorer making the blog posts not show up until the bottom of the left column. It should work fine in Safari or Firefox so give it a go there. I'm so glad you guys liked my post and are fans of Anne and bunting too!